The cherry surprise in these cupcakes makes me ridiculously happy. The kiddos in our family usually just lick the cream off cupcakes (I was beginning to think they’d be equally pleased with a plate of frosting), but they actually ate these cupcakes. They were smitten. 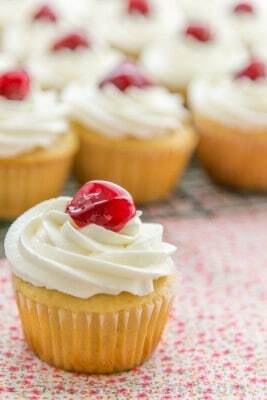 My cousin’s wife, Katya (who loves to bake), shared the idea with me to fill these cupcakes with cherries,… mmm. I’ve been on a honey spree so I tried honey instead of sugar in the cupcake recipe. I also used olive oil instead of butter and didn’t notice a difference in taste, but the next day, the batch of cupcakes with oil were soft as ever even after being refrigerated whereas the ones with butter in the batter… butter in the batter (I like how that sounds, sorry), as I was saying, butter in the batter (ha, ha) made the cupcakes firm the next day. 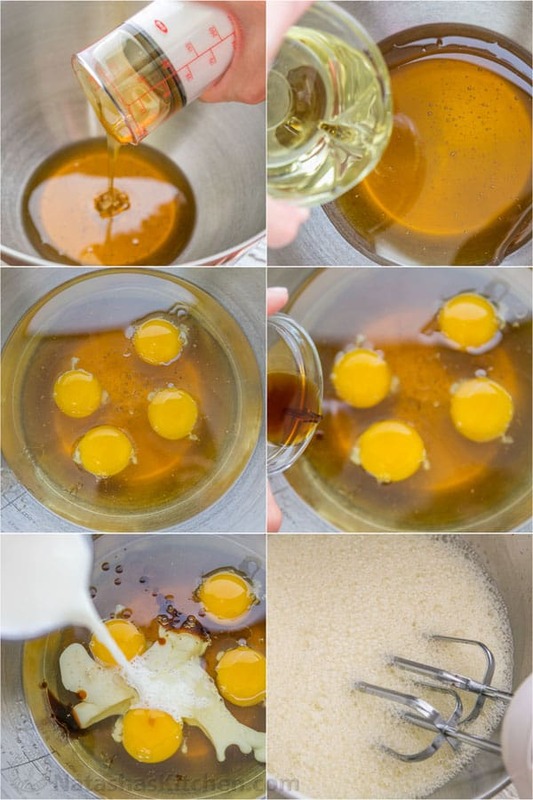 I tested this recipe thrice before posting (butter and sugar, butter and honey, olive oil and honey). The last one was my best batch (Otherwise I probably would have quite after the second batch, but I didn’t so now I’m up to my ears in cupcakes ;)). 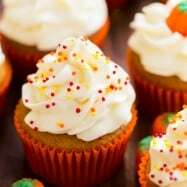 This recipe yields 24 cupcakes. You can easily cut everything in half and make 12. Enjoy! Preheat Oven to 350˚F. Line cupcake pans with paper liners and set aside. 1. 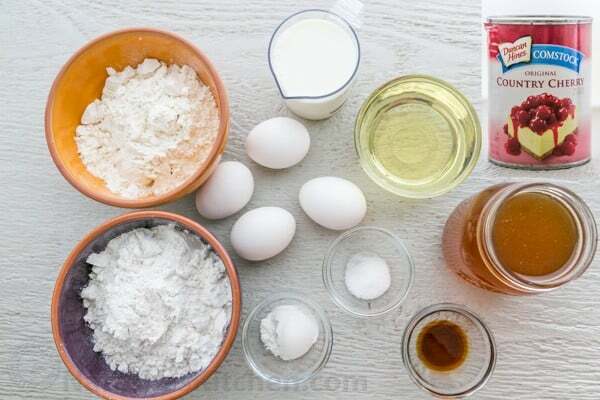 In the bowl of an electric mixer, beat together your liquid ingredients (3/4 cup olive oil, 1 cup honey, 4 eggs, 1 tsp vanilla, 3/4 cup milk) for 1 minute on high or until well blended. P.S. This OXO Adjustable Measuring Cup is fantastic for sticky ingredients like honey, peanut butter or Nutella if you need to measure it. NO WASTE! 2. In a separate large bowl, whisk together: 1 3/4 cups cake flour, 1 1/4 cup all-purpose flour, 1 Tbsp baking powder, 3/4 tsp salt. 3. Fold the dry ingredients into your wet ingredients 1/3 at a time and Blend until just combined. The batter should still be a little lumpy. 4. 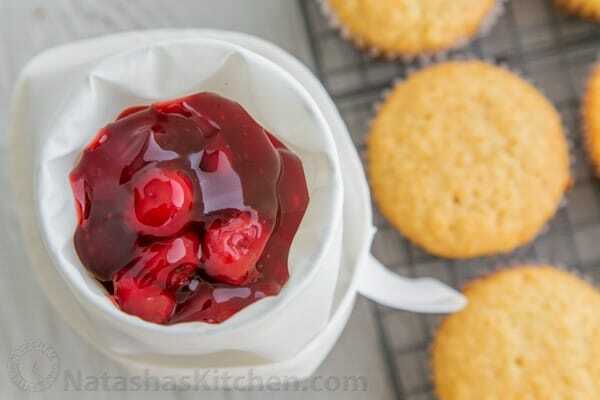 Use an ice cream scoop to transfer batter into the cupcake pan. Fill each cupcake about 2/3 of the way up (a full ice cream scoop). Bake at 350˚F for 15 -18 min or until a toothpick comes out clean and tops are starting to turn golden. 1. 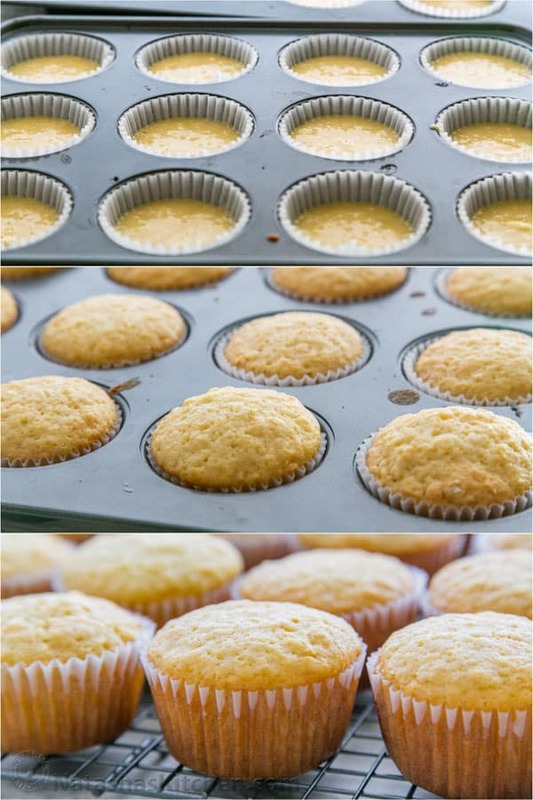 Once the cupcakes are cooled to room temp, you’re ready to fill them. 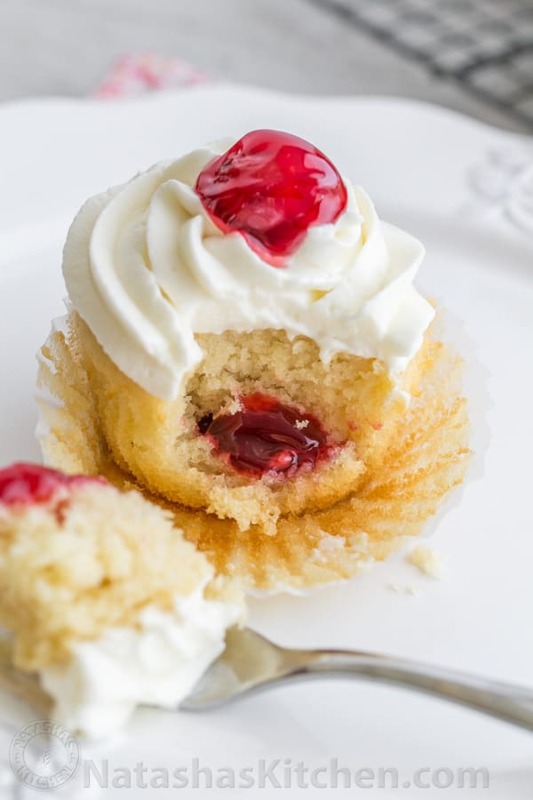 You can fill them one of two ways: cut out a piece of cupcake from the center and stuff with cherries, or you can use this method: put the cherries into a piping bag with an opening that is wide enough for the cherries to go through. 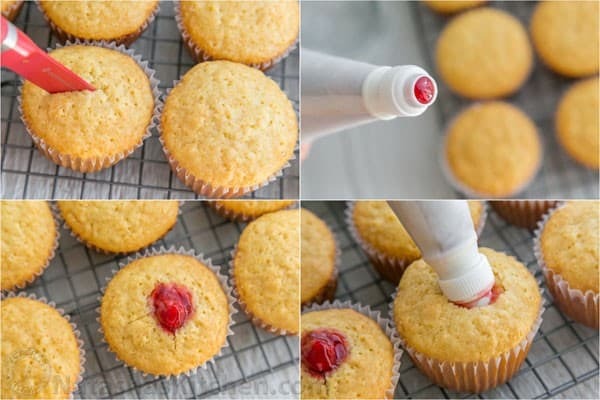 You need something with a firm tip (I just used a couple on the end) to push inside the cupcake so a ziploc won’t work (been there, failed at that). 2. 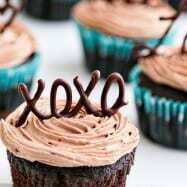 Use a paring knife to slice an “X” into the top of your cupcake going about 1/2 way into the cupcake. 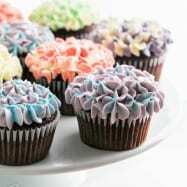 Put the tip of your icing bag into the X and squeeze in the filling until your piping tip is pushed out. Here’s a peek inside: Gahhhh!!!! 3/4 cup extra light olive oil do not use extra virgin! 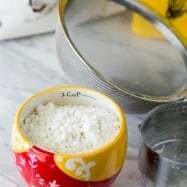 In the bowl of an electric mixer, beat together your liquid ingredients (3/4 cup olive oil, 1 cup honey, 4 eggs, 1 tsp vanilla, 3/4 cup milk) for 1 minute on high or until well blended. In a separate large bowl, whisk together: 1 3/4 cups cake flour, 1 1/4 cup all-purpose flour, 1 Tbsp baking powder, 3/4 tsp salt. 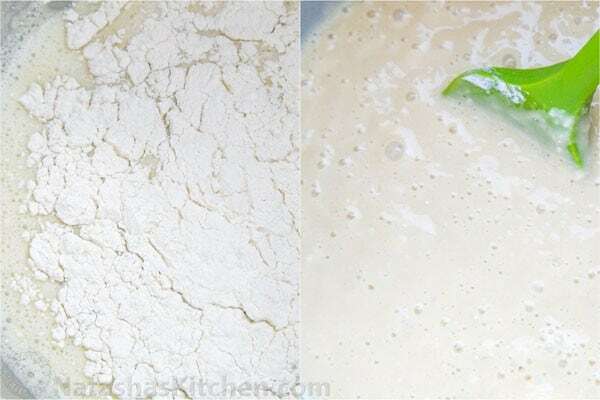 Fold the dry ingredients into your wet ingredients 1/3 at a time and Blend until just combined. The batter should still be a little lumpy. 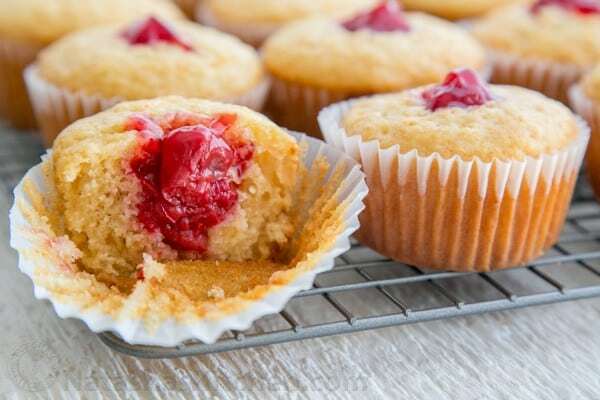 Use an ice cream scoop to transfer batter into the lined cupcake pan. Fill each cupcake about 2/3 of the way up (a full ice cream scoop). Bake at 350˚F for 15 -18 min or until a toothpick comes out clean and tops are starting to turn golden. 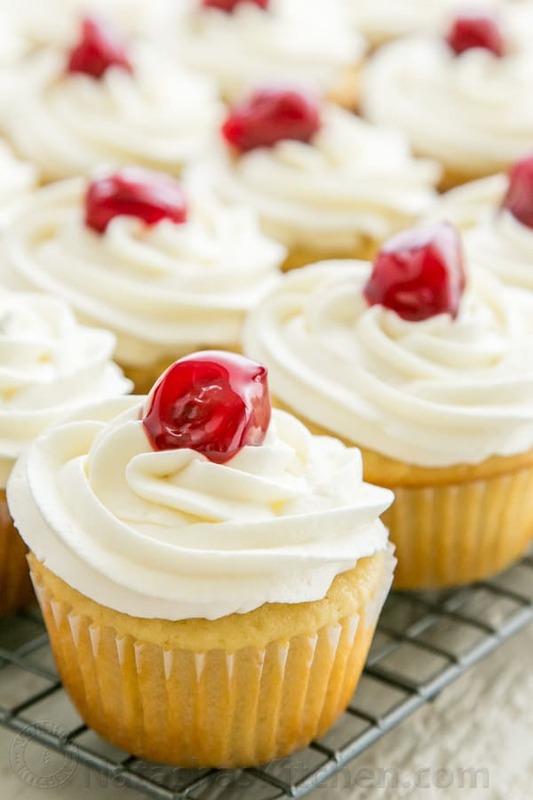 Once the cupcakes are cooled to room temp, you're ready to fill them.This can be done one of two ways, cut out a piece of cupcake from the center and stuff with cherries, or you can put the cherries into a piping bag with an opening that is wide enough for the cherries to go through. You need something with a firm tip (I just used a coupler on the end) to push inside the cupcake (so a ziploc won't work; been there, failed at that). 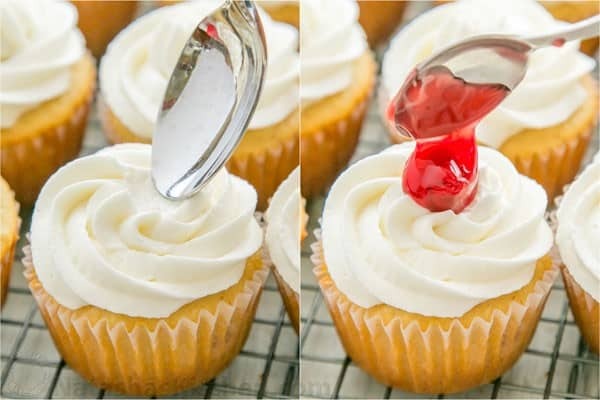 Use a paring knife to slice an "X" into the top of your cupcake going about 1/2 way into the cupcake. Put the tip of your icing bag into the X and squeeze in the filling until your piping tip is pushed out. 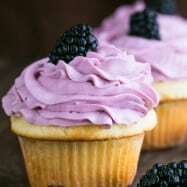 I tried baking this recipe (the all honey version) yesterday, and found it didn’t come out well for me.The cupcakes rose, but were an unpleasant texture for cupcakes – not fluffy and moist, but more dense and “bready”. They’re edible, but embarrassing to give to other people. Note: I made these changes: halved the recipe exactly (which made about 10 cupcakes). 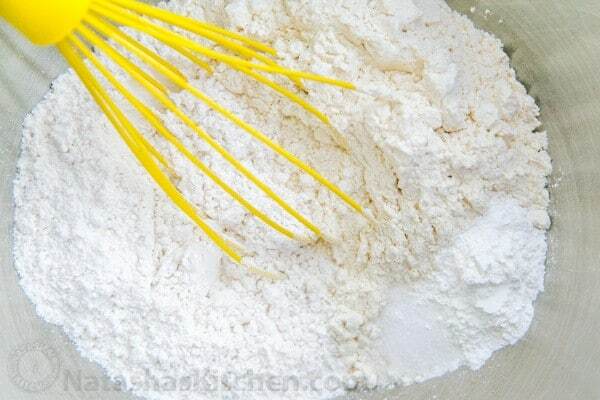 I substituted the cake flour using the cornflour + plain flour method. Otherwise, I followed the recipe as per instructions. Thank you for your reply (didn’t see the reply until now, whoops!). Unfortunately cake flour isn’t available in the UK. (I’ve seen various websites recommend the plain flour + cornflour substitution, it’s a shame it doesn’t seem to work here 🙁 ). Hi Natasha, that is exactly the substitution I followed. (Cornstarch is called cornflour in the UK, sorry for any confusion). 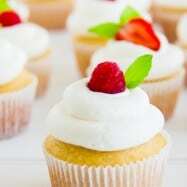 Hi, I really want to know this recipe for 12 cupcakes instead of 24. Any recommendations on storing these cupcakes if made a day or two ahead? Do they need to be refrigerated and would they still taste good? I actually found an answer in comments. Could you please tell, which electric beater you have used? I made these today and they came out good but next time i dont want to add any salt.. Can this be passed without salt? hello Natasha… this recipe sounds yummy… I was wondering. would it be yummy too?